Winning the battle of your weight loss struggles and becoming healthy requires determination to stick to a weight loss plan that works for you. 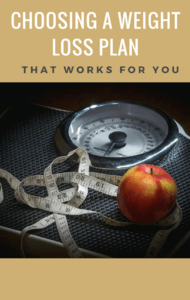 So many diets are structured for you to lose – not weight - but the battle itself. To really be successful, lots of planning and thinking needs to come before you begin to meet your goals. The plan must be nutritional and provide your body with nutrients and vitamins you need to avoid future health problems. You’ll also need an exercise plan, along with the diet, to keep your metabolism purring and so you have the energy needed to meet your weight loss goals. Any plan should be considered carefully and your goals should be attainable. If you have a lot of weight to lose, it’s best to divide your weight loss goals into small increments. Reaching those minor goals will provide the motivation you need to keep going with the ultimate goals in mind. Diet plans can be fads that come and go. Many sound incredible, touting that you can lose 10 pounds in 10 days or even more outrageous claims. But, there are five particular plans that have lasted over time and continue to help people lose weight and keep it off.